Repasz maintains an instrumentation with a total membership of 75-80, but occasionally has specific needs for additional musicians. We are limited as to overall band size due to rehearsal facility constraints. For specific information, prospective members are requested to contact our directors, Al Nacinovich or Jeffrey Dent. You may also download a copy of the Repasz Handbook here. 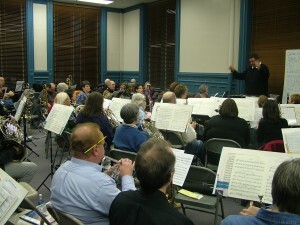 Rehearsals are held every Tuesday evening (with the exception of performance dates and the last 2-3 weeks of December) from 7:00 p.m. to 9:00 p.m. in Williamsport’s City Hall, second floor, 245 West Fourth Street, Williamsport, PA. If you would like to attend a rehearsal or two and “try us out,” please contact one of our directors. Dues – there are no membership dues. Rights and Responsibilities of Members – are outlined in the Handbook for new members. Uniforms – formal uniform jackets are issued by the Band. Each member provides a short- or long-sleeved white shirt, black tie, black pants, black shoes and black socks. Summer concert attire is a short-sleeved white shirt open at the collar without the formal jacket. A Repasz branded white polo shirt is available for purchase, as are black, medium-weight, nylon Repasz jackets and ball caps.